Dueling sparklers, a photo by The Bacher Family on Flickr. It's fun to experiment with fireworks photos on the 4th of July! This is one of my best. 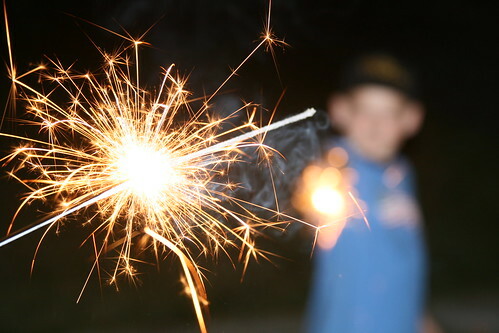 I shot it over the shoulder of my younger son as he played "dueling sparklers" with his brother. It's mostly lit by the natural illumination of the sparklers, though I did fire the flash to better light David in the background. I was suprised, today, to see this shot far and away my most popular image from my photo collection, despite being four years old. On investigation, I found that I had been picked up by some Tumblr accounts and spread around--see, for example, this link. It is, in my opinion, one of my coolest 4th of July shots!